Olive and Archie are bundled up and ready for their next adventure. You can read their new story here. 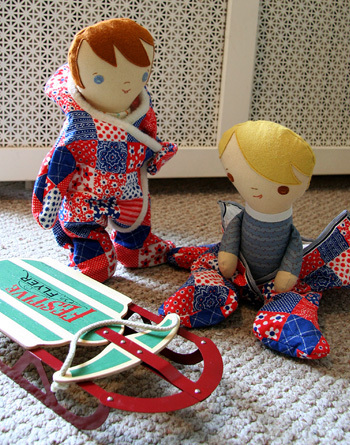 There will only be one pattern for this chapter, the unisex snowsuit, so it’ll be a cheapie. Should be up soon, I’ll send an email to the list when it’s done. Then it’s on to creating patterns for the knitted items I’ve made for them. I’m so excited about the knits! A little less excited about translating my very amateur knitting skills into patterns but they turned out so cute I really hope they can be recreated. They look SOO cute! I can’t wait to see the patterns! They are just adorable. Very cute outfits. Looking forward to the pattern. Your genius is beyond compare! Hi Hillary! I know you didn’t ask but one of my jobs at the yarn shop I work for is editing/proof-reading patterns for the shop. Anytime anyone creates a pattern for the shop I go over it for typos and also for pattern style to make it easy for our customers to actually follow the pattern. If any of that makes sense and you’d like some help with your knits, please let me know! Judging from the clarity that you bring to your sewing patterns you should do just fine!! I’m at tuliptoe (at) gmail (dot) com if you need any help! I think the Make-Along project is so much fun–not only the make-along parts but also the little storyline that goes with them. OH MY those snowsuits are Adorable!! I just love the fabric you used, and the bulky look. So cute–I can’t wait to make one! OH–can you reveal where the fabric came from? Wow! I need to show dd this after her nap!She’ll be thrilled. I stil have to make them sweaters, sleeping bags, cat friends, and a robot for spaceboy though. You keep me on my toes!!! How great! I’ve been following your blog for a little while, but I hadn’t full explored your blog yet. The make-a-long story is such a wonderful and innovative project. I always want to wear all the little clothes you create myself! Thanks so much for the New Year’s card! Its the most adorable part of my fridge! Fabulous, those snow suits are gorgeous! Ooh I cannot wait to see the knitted items that you designed. They look so adorable in their snowsuits too. Leil came in this morning and asked if we could check to see if there was a new story for Olive and Archie. What a delight to find this latest installment! I wish I could capture her smiles and giggling and give you a glimpse. Bravo! I just re-read through the whole story, and by the end I was grinning from ear-to-ear. You are truly talented. Thank you! those snowsuits are too cute. I cannot wait for the new patterns. You are amazing!